Small to medium size businesses (SMB) need contract management software that meets their needs today, but also prepares them for future growth. While SMBs and their contract management needs may vary to some degree, there is a core set of functionality that are generally important for almost all companies. The best contract management software for small or medium businesses will include some common requirements all companies need, such as contract storage, tracking, alerts, and sharing. There are other features that some may need, but not all, like authoring and red-lining. In this post, we’re going to explore why most businesses will benefit from a contract management solution (CMS), and how choosing the right one can save you time and money—and frustration-- by streamlining your processes and keeping you in compliance. If you’re reading this post, you’re probably already thinking about getting a contract management solution. And if you’re thinking about it, you probably need it! The right system will make your life easier, save you time, and help you avoid embarrassing and costly missteps. However, the wrong choice will either slow everything down, be a big distraction, or just wind up abandoned. Don’t buy your company an exercise bicycle that becomes an expensive clothes hanger! Get a tool that will make everyone’s life easier . . . especially you! While some packages offer features for all stages of the contract lifecycle, most businesses don’t use many of them. Instead, take a look at how you work and what you need, and then find a system that fits that, while still making room for growth. 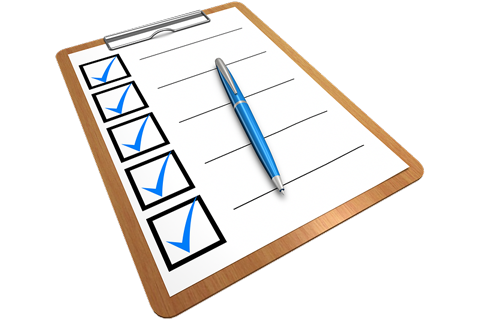 Use this checklist to help find the best contract management solution for your business. Security. This one is obvious, but it’s still the one that should be at the top of your list. With news of data hacks occurring regularly, the platform you choose should offer the latest in data security. Cloud based. Your contract management or tracking software should be cloud based. Cloud based platforms allow your team to access contracts when and where you need them instead of waiting for someone else to find it and email it. This feature also helps protect your business in the event of a hard drive crash or other computer issue that could restrict your ability to access contracts stored on your computer. In the past locally hosted options were usually safe enough. In today’s world find a cloud-based system with great security and you’ll be better off. Search feature that relies on optical character recognition (OCR). With OCR, your contract management software essentially “reads” and recognizes every word of each contract. Even if they come in right from the scanner. This means that you’re not searching on just the name of the files. Instead, it means that you’re also able to search on the content of the contracts. In other words, you’re not just searching. You’re finding! Unless all of your documents are easily searchable word files, you need OCR for your CMS! That’s it for the acronyms. Promise! Track all contract dates, even those that are automatically renewed. What’s the point of relying on contract management software if it can’t track all of your contract dates? Some systems only track the start and end dates. Look for a solution that can track all of your contract dates, especially if they automatically renew. Easy email alerts Look for a contract tracking solution that also enables you to set alerts including renewal dates, audit due dates, insurance expiration dates, etc., and that provides you with email reminders of these important dates. Getting reminded in the product doesn’t help if you or your team are not in it! Make sure alerts are sent to your (and others’) email. Track all your key formats. It seems intuitive but you’d be surprised how many times people forget to check this. If you keep contracts as Word documents, make sure your contract management solution can store Word documents. Or PDFs. Or Excel sheets. User management. You should be able to control who has access to which contracts or features, and be able to quickly remove users should the need arise without having to change everyone’s passwords. Integrations. If you use other services like DocuSign or SalesForce, look for a platform that integrates with those to streamline your team’s contract execution workflow. Also more and more companies are implementing Single Sign On. Try to find a solution that offers SAML 2.0 integration for programs like Okta or Active Directory. For more on this see our post on Integrations. Simple onboarding. No one wants to spend weeks manually uploading contracts. If you have a handful of contracts, onboarding is less of a concern, but ease of upload can become a deal breaker if you have more. You should be able to import your existing information into a system without having to re-enter it. If you have it somewhere. You have it somewhere, right? Even if you don’t, it should be really easy to enter information about contracts in the system. See this post for more information on onboarding. Organization. If you deal with several different types of contracts, such as vendor contracts, client contracts, employee contracts, lease agreements, purchase agreements, etc., then you should be able to group your contracts together so you can quickly find all contracts relating to a specific request. This is especially useful if you have several departments, with each using a handful of tools. Businesses often find overlap between tools, or even duplication, when they’re able to conduct a quick audit of all vendors. Multiple ways to add contracts. One of the most common shortcomings for contract management systems is that they don’t contain all the company contracts (or at least, all the important ones). Many systems can throw up barriers to getting new files in, which can make it challenging for your team to get the contracts where you want them. Make sure your solution has multiple ways for your team to get new contracts loaded. Uploading, emailing, and integrating with your e-signature solution or the most common entry points. Contract repository size. As a small to medium size business, you probably don’t need the ability to store massive numbers of contracts. Yet, as your business grows, you could need more space. Look for contract management software that allows you to easily increase the size of your repository when you need it. Easily Configurable. This is often overlooked as well. Many systems either can’t be customized, or require expert help (or at least the help of your IT team) to tweak. This leads to out of date systems which eventually lead to atrophy. Hello exercise bike! If the system can be easily updated, adjusted or changed when you need it to, it’s easy to get lots of value from it. In particular, make sure it’s easy to collect any specific information you need to report on. For example, if you’re in the leasing business, you may need to capture square feet. Or tenant improvements. Make sure the system can be customized to your needs easily. Simple Reporting. Many systems don’t allow you to get information out easily, or practically require you to learn a foreign language to master their reporting engine. You want a system that easily spits out the information you need, without complexity or big learning curves. Any report that you generate should also easily be exportable into CSV or Excel format for any advanced reporting needs/formatting you might have. Ease of Use. The more people that are going to use the system, the easier it needs to be. You don’t want to spend all your time training people and answering questions. The easier something is to use…the more it gets used. Ease of use is hard to define, but you know it when you see it. It’s intuitive to use. It means you can upload easily, find things easily, enter new information easily, and change things easily. When people look at your chosen solution and say…wow, that seems simple…you know you’re on the right track. Affordable. Software often has hidden costs. The obvious ones are things like implementation, maintenance, service, or add-on fees.. There is also the cost of your own internal IT resources, if required. And training costs. Look for a system that has a good overall Total Cost of Ownership. Make sure you take in the big picture on this one! Other Features. The above are the features that any good SMB contract repository should have. There are some other features that might be required, but often come with strings or complications. Be careful! Authoring. Some small businesses generate a lot of the same contracts over and over. If that’s the case, you may need a solution that allows you to easily create new contracts from a template as part of your CMS. However, the vast majority of small businesses typically don’t need this. Their contract volume doesn’t merit the larger investment, and their people are comfortable working in Word. Workflow automation/approvals. Some big companies have larger contract management systems (typically called Contract Lifecycle Management, or “CLM”, solutions) that automate their complex contract approval processes. Some SMBs also attempt to have rigorous approval processes or want to automate the sign-off process. This sounds great…until the reality hits. How do I change my approval process? What happens when the contract isn’t approved? How do I handle the back and forths? What happens when people leave? Some CLS solutions have excellent processes for this, but they require a much bigger implementation effort and more change management to implement. This is where you see the most failed implementations and vendor frustration. Red-lining. Red-lining is a part of any contract negotiation. While there’s often a desire to have that handled in your contract management solution, it’s rarely practical. SMBs typically don’t “control the paper.” They are often using someone else’s contract. They may be able to red-line in their tool but the counterparties probably will not. Most organizations use Word and can red-line successfully in it. If you really need integrated red-lining, look for it. But most companies don’t need to pay for this. You may not need all of these features now, but they are commonly needed as businesses grow. Your system should be flexible enough to store all of your contracts without missing anything. It should also allow you to add users and control access as your team grows and the various types of contracts you handle changes. It should allow you to collect any specialized information you need for reporting, and report out easily. Finally, it should all be very secure, cloud-based, and affordable. We hope this checklist will help you find the absolute best contract management software for your small or medium business. If you’re a small to medium business and you’re looking for a contract management and tracking option that will grow with your business, start your free trial with ContractSafe now.